Jubilation is a design that says it all with the letterforms. This style is the type you send out when you want to shout out your joy from the mountain tops. It says joy and elegance all within the brushstrokes of the letters. This graceful letter style has a rough edged, hand lettered dry-brush look. Every word and every line is on a curve and an angle; every line is a different size and length, plenty of swashes and swirls bring lighthearted joy. Add a special trim edge like the scallop to create extra style. 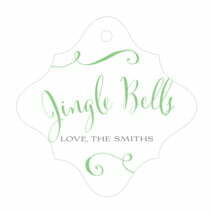 Customize your Jubilation holiday gift tags today! Jubilation holiday gift tags are printed on extra-thick cover weight white paper and come in a variety of shapes and sizes (including square, circle, a scallop-edged circle, ovals, and other more intricate shapes). People like to use a special ribbon, baker's twine, elastic, hemp twine, or even wire to create the look they are after for the holiday presents. Holiday gift tags come pre-punched with a small round hole to thread your choice of tying material. They are punched out individually and packaged as a set in small bags. Choose a shape and color above to start customizing your Jubilation holiday gift tags today!